ProCurve Glass provides high-performance, laminated glass products that address both everyday needs and specialised product challenges. The company’s laminated glass products include safety, blast-resistance, hurricane protection, fire-rated, UV protection, insulated, and energy-efficient solar control glass. All glass products can be provided with type approval from your designated marine classification society. ProCurve supplies its products to the workboat, passenger cruise construction, luxury yacht, automotive, rail transit, and aircraft markets. Fire-rated glazing is needed to meet code requirements utilising an intumescent interlayer for maximum protection against temperature increases. ProCurve products are safety rated and are suitable for interior and exterior applications. Products comply with ISO 5797 and provide protection against fire exposure for 60 minutes without transmission to the non-fire side (AO). An A60-rated product is also available to protect an insulated solution against temperature increases, along with framing and glazing options depending on your requirements. Reducing glass to block 50% or more of the heat gain effects from solar absorption is available for flat and curved glass solutions as part of a laminated product. Bulletproof windows are available to meet European Standard CEN 1063, US Standard for National Institute of Justice NIJ 0108.01, or standardisation agreement (STANAG). Depending on the required standards for a multiple ply-laminate glass solutions, high-performance interlayer or polycarbonate materials are available. ProCurve will design a specific transparent armour system that is suitable for your requirements. Heated defrosting or deicing windows for transportation and marine vessels using thin wire technology are available to provide a distortion-free laminated glass product. Radar shielding glass is also available as a laminated glass product. Using our HPML-CG laminated marine glass there are limitless opportunities to design innovative solutions for passenger and military vessels, as well as cruise ships and work boats. Our high-performance glass windscreens are available in flat, cylindrical, conical, and irregular 3D curves. The laminated glass withstands multiple types of physical or chemical attack. The multi-sheet glass and interlayer laminates allows the end-user to benefit from the safety and security of this product. Laminated glass blocks ultra-violet (UV) radiation, reduces heat absorbing effects from solar-infrared radiation, incorporates light or sound-reducing features to the final product. ProCurve’s personalised service assist you in your particular needs and applications. The company provides solutions for issues such as spall protection with ballistic materials, thin glass laminates with UV blocking, or superior optics and protection against harsh marine environments. A key feature of laminated glass is that it can be used as a structural material and exhibits post-breakage performance and strength as opposed to tempered glass that disintegrates upon failure. ProCurve Glass is an experienced specialty glass fabricator with more than 28 years of laminated glass processing experience in a wide variety of applications worldwide. The company has an installation support network to respond wherever you may need our product. Our products come with type approval from the classification societies and have been approved by the Royal Institution of Naval Architects (RINA), DNV-GL, Lloyd’s Register, the American Bureau of Shipping (ABS), and Bureau Veritas (BV). We work closely with our customers to respond quickly to support their requirements, whether it is for a new product going through design approval or supplying replacement glass on a huge tanker. ProCurve also supports you with your installation and glazing requirements. We offer lightweight glass constructions for interior and exterior applications, which include superstructures, windscreens, handrails, pilothouse windshields, portlights, moveable moonroof, or fixed roof or walking surfaces. ProCurve Glass Technology will be exhibiting its high-performance marine glass solutions at the 2018 New Orleans International Work Boat Show. Laminated glass has been used extensively within the automotive industry for more than 80 years. This company video showcases Procurve's glass design process. 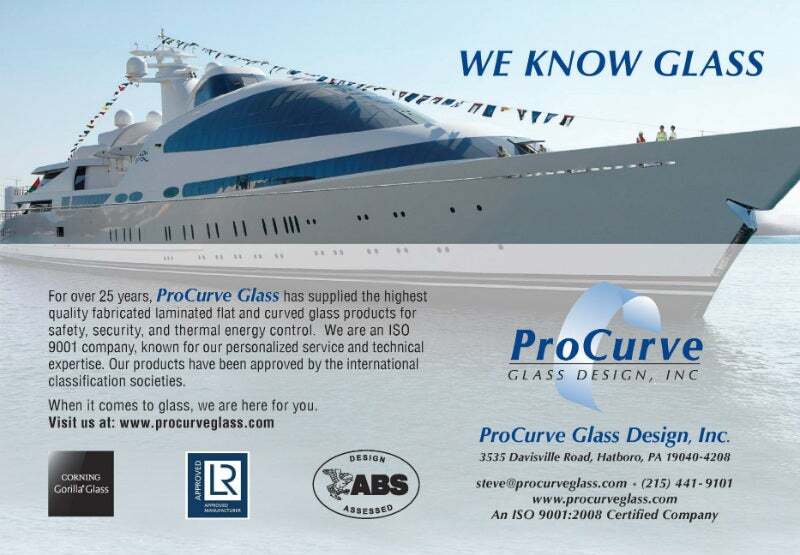 ProCurve Glass Technology, manufacturer of high performance marine glass and glazing solutions, will be exhibiting at the Fort Lauderdale International Boat Show, 1-5 November in the Superyacht and Designer Pavilion (booth 696) and at the International Workboat Show (booth 2137), November 29-December 1st in New Orleans, Louisiana, US. ProCurve Glass Design is now offering lightweight marine glazing that meets Classification Society requirements. By incorporating Corning Gorilla® Glass into its laminated glass products, the glazing design is stronger and lighter than traditional glass laminates. Additionally, these products offer high resistance to scratches and sharp contact damage due to its superior surface quality. Chemically strengthened laminated glass manufactured by ProCurve Glass makes flat and bent marine glazing stronger, lighter in weight with improved optical quality and impact resistance. ProCurve Glass Design has updated installation and maintenance guidelines for installers of marine glazing products. ProCurve Glass, a leader in the glass industry, will be exhibiting its specialty marine glass products at the upcoming International Workboat show, taking place at the Ernest N. Morial Convention Center in New Orleans, Louisiana, US. Visit us at Booth 2105 from 30 November to 2 December 2016.